Several use cases and success stories from different industries that show how AI is applied successfully today. In their efforts to deploy and apply Artificial Intelligence (AI) in their organizations, many companies are facing certain challenges, lack of resources and skills being among the most significant ones. 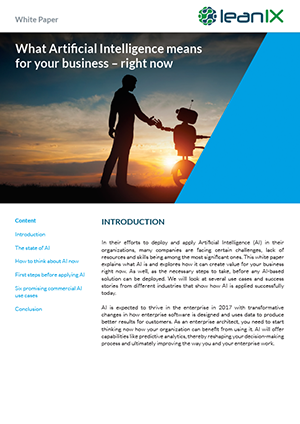 This white paper explains what AI is and explores how it can create value for your business right now. As well, as the necessary steps to take, before any AI-based solution can be deployed. We will look at several use cases and success stories from different industries that show how AI is applied successfully today. AI is expected to thrive in the enterprise in 2017 with transformative changes in how enterprise software is designed and uses data to produce better results for customers. As an enterprise architect, you need to start thinking now how your organization can benefit from using it. AI will offer capabilities like predictive analytics, thereby reshaping your decision-making process and ultimately improving the way you and your enterprise work. Fill out the form on the right to read the full whitepaper.